Each Spring, the lake calls us to come and dip our poles in to find some fish. This past week has been no exception. The weather, between showers, has been mild and cloudy (great fishing weather). My DH and our son have enjoyed some wonderful moments together already this spring. It also helps that they have caught a few fish (and released them). I remember as children growing up, my MaMa and PaPa sharing their love of fishing and family time. I learned as a young girl to lip a fish and to bait a hook. Isn't that what all young ladies learn? When Ken and I got married, we also enjoyed going fishing and still do. You will normally see me reading a book while fishing, especially when it is a slow day! Now we as a family, go fishing together. It is a special time spent talking, laughing and enjoying God's beauty together. 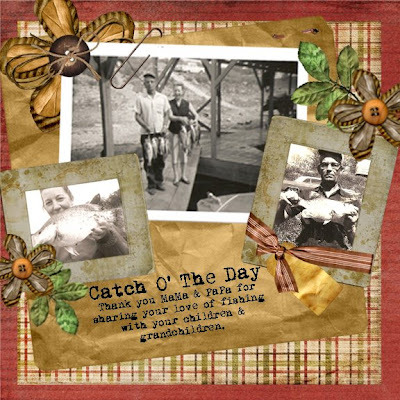 Thank you, MaMa and Papa, for teaching us the love of fishing and especially spending time as family.